Reading this book took me back to some of my own experiences and the stories were strength for my heart. I loved reading of the victorious walks coming from hard circumstances. 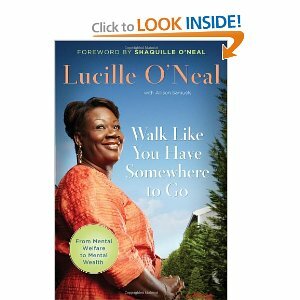 Lucille O’Neal shared her personal struggles and gave credit to the Lord for helping her through hard times. She asks at one point: “But how can we expect to receive God’s love, mercy, and grace if we’re not ready with open arms?” and that question is a theme to the very end of the book. I loved the forty scriptures she shares at the end of the book and the personal notes she added to each. When I finished this book, I felt renewed hope that age shouldn’t stop diving into dreams and it has helped me learned to … walk as if I have somewhere to go!